It must be a disconcerting time to be a Unionist. The very fabric of the UK is fraying at the edges at an alarming rate. Scots were a mere five percentage points from backing independence in 2014, while Brexit represents the biggest centrifugal force in the history of the British state. Meanwhile, the English people are in iconoclastic mood. Politics is changing. The rise of Jeremy Corbyn - a long-time advocate of Irish republicanism - has been largely consequence-free, electorally-speaking. Indeed, he may soon become Prime Minister. For Unionism, reliant on a combination of superior numbers on one side of the Irish Sea - and the acquiescence of the British public on the other - the medium-term is as far forward as things get nowadays. And yet unionist politicians do little to shape their future or respond to the existential challenges right in front of them. Ask Peter Robinson. His speech at the MacGill Summer School last July made the entirely reasonable point that unionists should prepare for the day that a border poll is upon them. An inconvenient truth to some unionists’ ears, but a self-evident fact nonetheless. I say none of this to gloat; unionists, like anyone else, are entitled to their views and to take pride in their heritage. I would contend that, as an ideology, Ulster unionism has represented little more than a systematic abuse of power: An organising concept to make partition endure, encouraging and rewarding sectarianism in the process - but it always hurts to see your side losing, whichever tribe you belong to. And, yet, the facts are the facts. Just two short years of Northern Ireland’s centenary and there’s little to cheer. Events are now spinning out of control for unionists. They are unable to repel the electoral and demographic tides that in just a few short years will activate the Good Friday Agreement’s provision for a border poll. When that day comes, unionists will find that it’s a case of ‘ourselves alone,’ as Britain remains unmoved at the prospect of being sheared of its vestigial presence on the island of Ireland. Added to this is an overlooked new element. Post-Brexit, it will no longer be a binary question: ‘Do you want to live in a united Ireland’ or not. The hidden, supplementary point is whether people want to regain the benefits of being part of the European Union. This is a powerful new dimension and will broaden the appeal of Irish unity in due course, offering small ‘U’ unionists a pragmatic ‘something for something’ choice. Irish unity might not be enough of an attraction on its own, but if you reacquire the benefits of EU membership in the process, then you might be persuadable. In other words, you can learn to live with it. As ever, though, Unionism is hampered by unionist politicians. 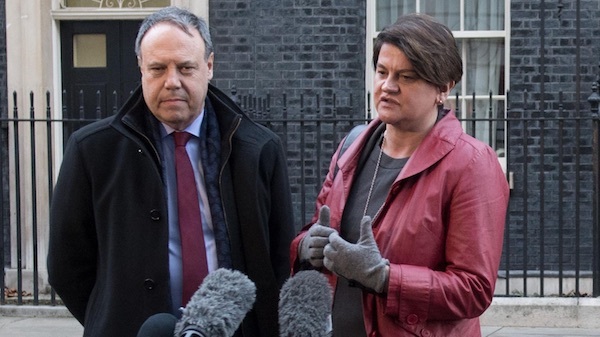 Through a combination of hubris and incompetence, the DUP has overplayed its hand throughout the Brexit negotiations. Instead of internalising that the backstop was an inevitable requirement of any deal and setting the ground accordingly, they thought they could browbeat Theresa May instead. Given Northern Ireland represents just 1.5% of the UK economy, they were always on a hiding to nothing. The Prime Minister might be fond of referring to ‘our precious Union’ every time she mentions Northern Ireland, but it was always artifice. As the Juncker/Tusk letter makes plain, she didn’t lift a finger to try and renegotiate the backstop. I’ve argued she was always going to do what is in the interests of Britain, not the United Kingdom, when it came to Brexit. Despite the current turmoil in Westminster, two-thirds of Conservative MPs were prepared to support Theresa May’s Withdrawal Agreement, including the backstop. Read the signs: British politics is done with Northern Ireland. Despite this, Irish foreign minister, Simon Coveney, believes we should eschew mention of a border poll. He says talk of Irish unity is ‘hugely unhelpful.’ He is quite wrong. More should be expected from unionists in terms of engaging with reality. All the empirical and rational evidence tells us there will be a border poll in the next few years, spurred on, no doubt, by the fallout from Brexit. What is remiss is to continue to condescend to unionists in the faint hope of not upsetting their sensibilities. They can read the same polls I can. Indeed, its discourteous to them to pretend otherwise. The unfolding debate about how and when this island becomes one state can be had without rancour or triumphalism.